A SAN (Storage Area Network) is a network specifically dedicated to the task of transporting data for storage and retrieval. SAN architectures are alternatives to storing data on disks directly attached to servers or on Network Attached Storage (NAS) devices that are connected through general purpose networks. SAN’s purpose is to transmit data between storage systems or storage systems and client servers. The SAN fabric contains physical connections from storage systems to client, then storage management devices, servers, and network devices. However, SAN is usually defined as block I/O services provider. 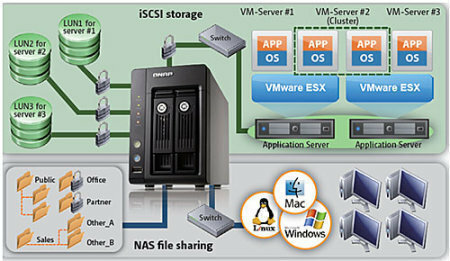 The storage system contains storage components, devices, computer equipments, software applications, and network devices. SAN can attach to various storage devices such as disk-array subsystems, CD towers, magnetic tape drivers and libraries, and provides data I/O services via hub or switches through network connections. Storage Area Networks are traditionally connected over Fibre Channel networks. 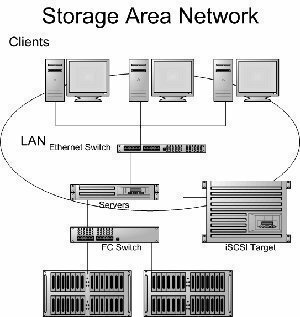 Storage Area Networks have also been built using SCSI (Small Computer System Interface) technology. An Ethernet network that was dedicated solely to storage purposes would also qualify as a SAN. 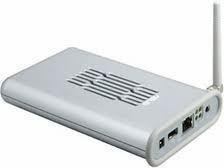 Internet Small Computer Systems Interface (iSCSI) is an SCSI variant that encapsulates SCSI data in TCP packets and transits them over IP networks. Fibre Channel over TCP/IP (FCIP) tunnels Fibre Channel over IP-based networks. The Internet Fibre Channel Protocol (iFCP) transports Fibre Channel Layer 4 FCP on IP networks. By integrating storage devices, SAN increases storage space usability and cost efficiency. SAN is the high speed storage sharing system. 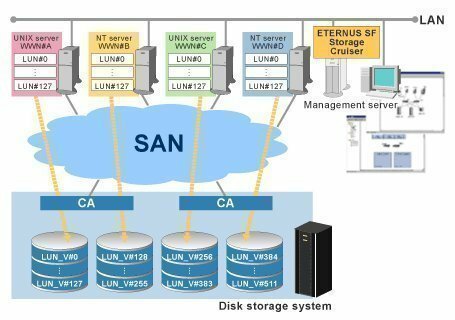 SAN reduces storage management cost since it simplifies the system fabric and devices management. How can I learn SAN. Please let me know if you know any one who teach SAN. Can I access or use the drives of SAN ( attached to servers) from other client machines ? 123 queries in 0.434 seconds.